South Korea Seoul Youth Hostel is so caring. A variety of facilities is provided for its visitors. Room guests who are truly take care of their health can stroll in the park near the hostel. 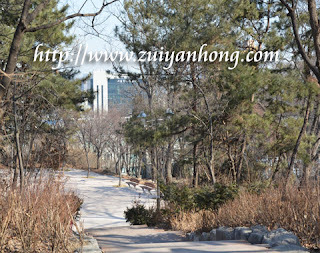 Follow the track and go up the slope to breathe fresh air of Namsan. You also can have a birdview of South Korea capital city, Seoul down at the foot of Namsan. Ascending height to enjoy the glamour scenic of Seoul is really a remarkably sweet memory.